Keep up with Ability West's upcoming events, fundraising and more right here. Ability West’s AGM will be held on Monday, 28th May 2018 at 7:30pm in The Clayton Hotel, Galway City. All are welcome to attend. Funds raised will be utilised to build a new day service for adults with intellectual disability in Headford and surrounding areas. Event is open to tractors, trucks and vintage cards and entry fee is €20. 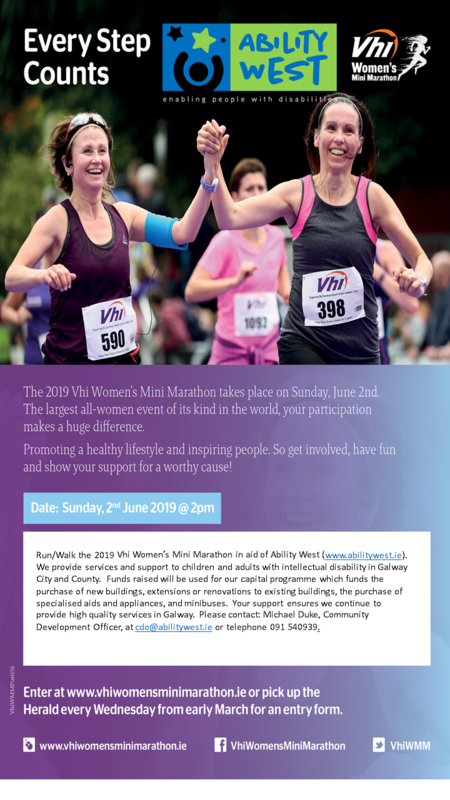 Why not run or walk the Women’s Mini-Marathon in aid of Ability West. Contact Michael Duke for details - 087 7730105. Join us on Saturday, 15th June at 12 noon as we attempt to break the Guinness World Record for the largest ‘Rock the Boat’….we need your help!!! The annual golf event in association with Galway Golf Club takes place on Saturday, 24th August. More details to follow.